Feng Sun Chen’s first book is Butcher’s Tree from Black Ocean. She is also the author of chapbooks Ugly Fish, Paul Thek, and blud (Radioactive Moat and Spork Press). Recent poems appear in Conduit, >Kill Author, and Claudius App. Monkeybicycle: In the acknowledgements for Butcher’s Tree you thank the editors at Black Ocean for putting up with what you call your “Amorphousness.” Can you tell us the story behind that light-hearted apology? Feng Sun Chen: The revision/editing process of Butcher’s Tree must have been rather frustrating for the editors because I changed so much of it so fast, I think Janaka said at one point it was like reading a whole different book when I sent the 4th or 5th draft. It was hard for me to settle myself, and I had all sorts of apprehensions and anxieties about the poems, but it worked out in the end. Mb: “Milk Vein”, the opening section of Butcher’s Tree, is filled with bones and redness and teeth. Where do these images come from? FSC: Sometimes I think about how tumors often contain strange growths of teeth and hair. At the time these poems were written, I was trying to articulate a very particular feeling that I could sort of connect to very tightly wound fists, knuckle bones close to bursting out of the skin. The energy that makes you want to tear flesh from bones or crush something with your teeth. Mb: In several places, particularly in “Wolf Teeth”, you collage violence with nature. It is actually a book about the body. The moral is Open the Body like the Goose’s, the one filled with golden eggs. as I look from page to leaf to page. Thin like skins. Is this mixture a conscious or subconscious combination? FSC: Probably both. I’m not sure how to tell the difference sometimes, but I know I’m a very intuitive writer, whatever that might mean! Mb: In that same second section, many of the poems are much longer than in the previous. What dictates a poem’s length for you? Do you simply keep working on a piece until it is done, or do you have pre-conceived lengths in mind for certain poems? FSC: I don’t usually have set lengths for poems before I start them. Most poems I write end when I feel like a mood has been exhausted, or if I feel like I managed to articulate what I wanted. Endings are the most difficult and often feel fake, like a very deeply ingrained bad habit in me that compels me to wrap things up with a nice note. I think I liked having neater endings for some of the poems here because I was consciously working with narratives, mangled folklores, and I wanted to provide the feeling of hearing a fable or parable, which tend to have distinct endings. So the length would often depend on when the mysterious feeling seems to arrive. Mb: The final movement of Butcher’s Tree, “Grendel is a Woman”, focuses new energy on one of the most canonical pieces of classic literature. How did this concentration come about, and why the impetus to shake and shift its roots? FSC: It might be a selfish attempt to force a relationship to something I feel alienated from. My detachment from most canonical works allows me to be pretty brutal with how I influence, get influenced by, and how I mutilate them. At the time, I was thinking about the monstrosity of marginalized bodies, how lonely it is to be monstrous. I was also thinking about gender, genre, and the violence that is necessary to maintain demarcations between categories of each, the “sacrifice” that is expected when you inhabit a single, coherent one, particularly if feminine or female, the contradictory desires that are compounded within that performance. I’ve always sympathized the most with the villain, the alien, the “outsider,” and maybe this is due to growing up as a non-white immigrant in an absurd country. Heroes are so boring and unrelatable to me, of course I wanted to write through the voice of the alien. 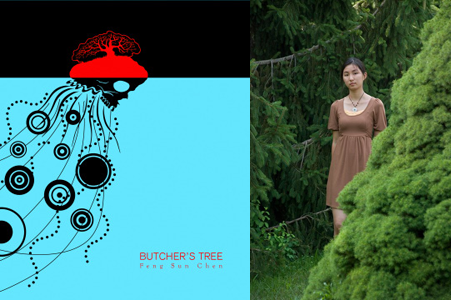 Purchase a copy of Butcher’s Tree here, & read more from / about Feng Sun Chen here.